It has been suggested that List of meat-based sauces be merged into this article. (Discuss) Proposed since February 2019. Sweet rujak sauce. Made of palm sugar, tamarind, peanuts, and chilli. 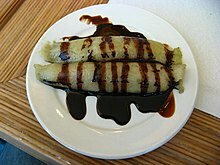 The following is a list of notable culinary and prepared sauces used in cooking and food service. 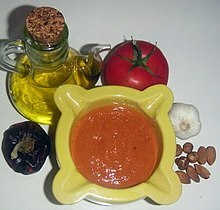 Salad dressing – A mixture of small pieces of food, often served at room temperature or chilled. Sweet chili sauce – Condiment made with chilies, rice wine vinegar and some sweetening ingredient such as fruit or a refined sugar. Sauce "Pickles"– a yellow vinegar based sauce with turmeric, mustard and crunchy vegetable chunks, similar to Piccalilli. 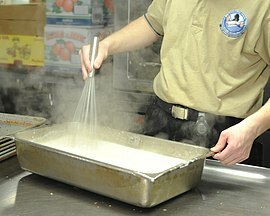 Sauce Béchamel – milk-based sauce, thickened with a white roux. Sauce Espagnole – a fortified brown veal stock sauce. 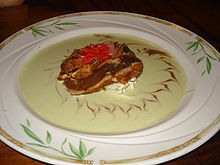 Sauce Velouté – white stock-based sauce, thickened with a roux or a liaison. 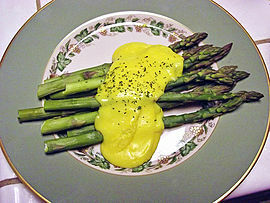 Sauce Hollandaise – an emulsion of egg yolk, butter and lemon or vinegar. Chilli soy lime – a mixture of soy sauce, chopped bird's eye chillies, chopped onions, and calamansi lime juice—a traditional dipping sauce for grilled meats and seafood. 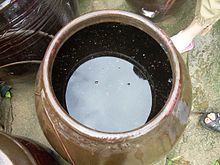 The island of Guam has a similar sauce called finadene. 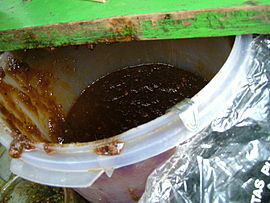 Liver sauce – used primarily as a dipping sauce for lechon or whole roasted pig. 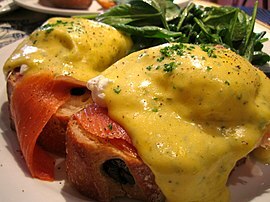 Flavour is savoury, sweet and piquant, vaguely reminiscent of British style brown sauces but with a coarser texture. Cebolada – an onion sauce of Portuguese origin used for fish and game. ^ Bruce Bjorkman (1996). The Great Barbecue Companion: Mops, Sops, Sauces, and Rubs. p. 112. ISBN 0-89594-806-0. ^ Schlesinger, Fay (November 3, 2009). "It's out after 170 years, the secret of Worcestershire Sauce... found in a skip". Daily Mail. Retrieved September 16, 2012. ^ Whitehead, J. (1889). The Steward's Handbook and Guide to Party Catering. The Steward's Handbook and Guide to Party Catering. J. Anderson & Company, printers. p. 273. Retrieved June 15, 2017. ^ Escoffier, Auguste (1969). The Escoffier Cookbook. Crown Publishers, Inc.
^ Corriher, Shirley (1997). "Ch. 4: sauce sense". Cookwise, the Hows and Whys of Successful Cooking (1st ed.). New York: William Morrow & Company, Inc. ISBN 0-688-10229-8. ^ Louisette Bertholle; Julia Child; Simone Beck (2011). Mastering the Art of French Cooking. 1. New York: Alfred A. Knopf. ISBN 978-0-307-95817-4. ^ Carrington, Sean; Fraser, Henry C. (2003). "Pepper sauce". A~Z of Barbados Heritage. Macmillan Caribbean. p. 150. ISBN 0-333-92068-6. ^ Elizabeth David, Italian Food (1954, 1999), p 319, and John Dickie, Delizia! The Epic History of the Italians and Their Food, 2008, p. 162. ^ Jung, Soon Teck & Kang, Seong-Gook (2002). "The Past and Present of Traditional Fermented Foods in Korea". Archived from the original on December 23, 2007. Retrieved January 7, 2008. ^ Smith, Andrew F. (May 1, 2007). The Oxford companion to American food and drink. Oxford University Press. p. 29. ISBN 978-0-19-530796-2. Retrieved March 14, 2012. ^ Hall, Phil (March 19, 2008). "Holy Mole". The Guardian. London. Retrieved August 20, 2010. ^ John B. Roney (2009). Culture and Customs of the Netherlands. ABC-CLIO, LLC. p. 133. ISBN 978-0-313-34808-2. Retrieved May 21, 2012. ^ Eve Zibart (2001). The Ethnic Food Lover's Companion: A Sourcebook for Understanding the Cuisines of the World. Menasha Ridge Press. p. 270. ISBN 978-0-89732-372-7. ^ "Definition of mujdei" (in Romanian). DEX online. ^ "John Lichfield: Our Man In Paris: Revealed at last: how to make the French queue". The Independent. July 2, 2007. Retrieved September 5, 2012. ^ Edge, John (May 19, 2009). "A Chili Sauce to Crow About". New York Times. Retrieved May 20, 2009. ^ Cameron, J.N. (2015). Seven Neighborhoods in Detroit: Recipes from the City. Beneva Publishing. p. 148. ISBN 9780996626101. Corriher, Shirley (1997). "Ch. 4: sauce sense". Cookwise, the Hows and Whys of Successful Cooking (1st ed.). New York: William Morrow & Company, Inc. ISBN 0-688-10229-8. Brandau, Mark (August 30, 2012). "Restaurant chains experiment with sauces to add flavor". Nation's Restaurant News magazine. Retrieved September 5, 2012. "Emerging Sauces". Foodservice Research Institute. 2011. Retrieved September 5, 2012.